HARLINGEN - The general manager of a billboard company said a heinous crime compelled him to help police bring an alleged criminal to justice. Luis Betancourt said he saw the stories of abuse involving Waldo Sanchez. He wanted to make sure everyone got a chance to see the suspect's face. Police said it was that pressure from the media that compelled Sanchez to turn himself in to police on Thursday. Sanchez has been charged in the baseball bat beating of a woman. Police said the victim suffered broken bones in the attack. 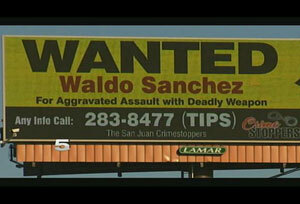 Sanchez's image was on display on six digital billboards in Edinburg, Weslaco, Harlingen and Brownsville. Betancourt said the company also uses the billboards for Amber and Silver alerts. "When I heard about it, it really got me. ... It got me in the sense that what man would grab a baseball bat and beat up a woman?" Betancourt said. "I'm not here to judge, and I'm not saying whether he's guilty or innocent," he said. "I was just helping San Juan police apprehend this individual," Betancourt said. "He'll go through the court system, and it is somebody else's job to find out whether he's guilty or not," he said. Betancourt said his company typically charges about $1,000 to display advertisements on billboards for a few days. The company has 1,300 billboards in the Rio Grande Valley. He said in this case money was not the motivating factor behind the displays. "It's a service that we provide, and ... it's not a loss, it's a gain. We apprehended a fugitive. That's that way I see it," Betancourt said. The original segment appeared on KRGV-TV. Lamar Advertising Company (Nasdaq: LAMR), a leading owner and operator of outdoor advertising and logo sign displays, announces the Company’s operating results for the third quarter ended September 30, 2012. Lamar Advertising Company (Nasdaq: LAMR), a leading owner and operator of outdoor advertising and logo sign displays, announced today that its wholly owned subsidiary, Lamar Media Corp. (“Lamar Media”), has closed its private placement of $535 million in aggregate principal amount of its 5% Senior Subordinated Notes due 2023 (the “5% Notes”).